Week 21 Can we be too HAPPY? OK I thought about that for a day. At first I was looking out there for all kinds of things I really enjoy doing. That wasn’t it. So I looked within, and discovered something new. I normally am Happy and then everything around me just makes me Happier. I was focused on an event in my house Wednesday. My 4-year-old granddaughter’s birthday. 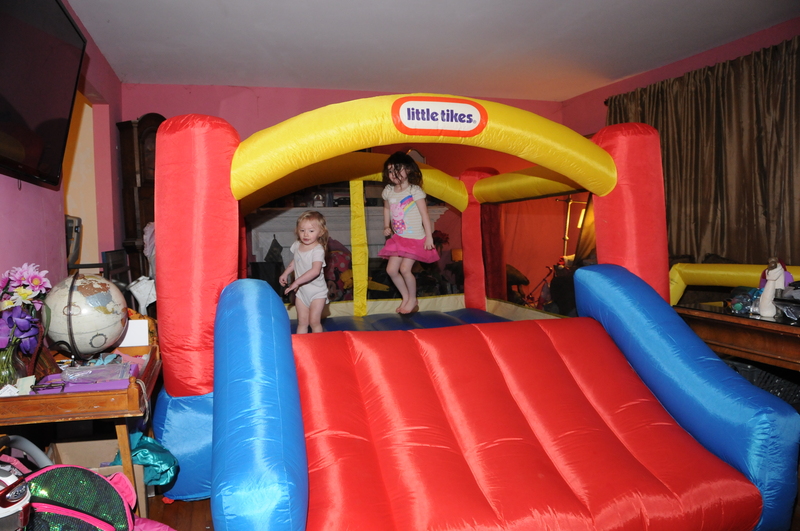 My daughter Ashley put up a bounce house in the living room. I heard the motor fire up and make all kinds of strange noises. I went to look and the thought I had was how delightful. I went and got the camera to take some pictures. Kids are being kids and having fun. Then wonderful Raphaela (my wife) gets home. So I’m reading the question Dan made and I am working on the idea of; did that make me Happy? Well yes. But the real truth here is I’ve been working on making this family more Loving by being more Loving, creating a more harmonious home by being more harmonious. So to one degree I am doing something by planting Love and reaping Loving & Happy events like this. Creating an environment of harmony doesn’t Make something happen. For me I see that working towards the natural Love we have at birth, is the place we should be. We are created to be a Loving Being. When I’m there, and I’m not always. I am available to be Happy and spread more Love and Happiness. So basically I’m against the word “MAKE” when I feel we earn this happiness by being where we should be in the first place. Just in case you’re bored someday. 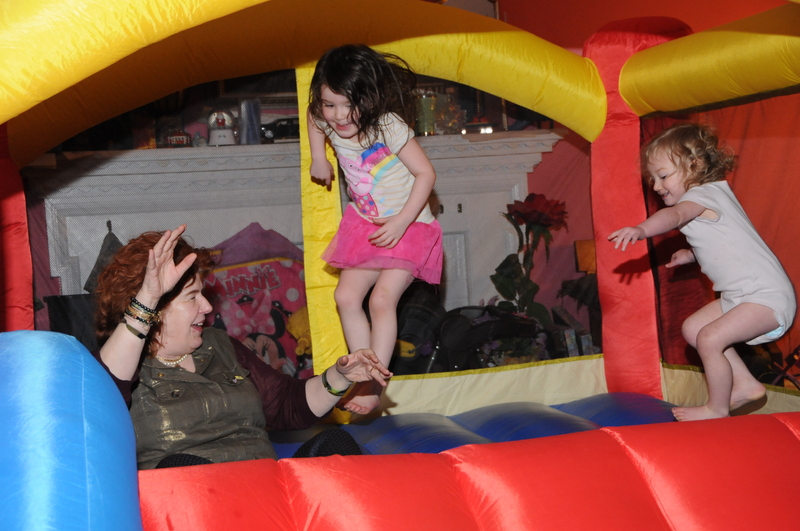 Put a bounce house in the Livingroom and invite some kids over; OMG. You will never believe the fun that can generate one little thing like this. For my buddy Dan. What a delightful question you proposed and gave me a HAPPY day to search for Truth. For that Dan I thank You. I’m blessed to have such friends who plant Love in my Life. I can hardly wait to go to Canada and meet Mr. Dan. This entry was posted in Master Key Experience on 02/26/2016 by masterkeyrea. Many months ago a friend died and my emotions got the best of me. Being in the class I asked for help and received just that. I was able to embrace the emotions which I’ve tried to hide all of my life. I wrote a Press Release about ME. Yes, this was a hurdle I had to climb over. Now the emotions are of my greatest strengths I own. In the Lesson we are on this month. I took the wisdom hidden the words and searched for all of the meaning I could possible squeeze out. In the heart felt sense of helping others and giving something of myself. I took a step towards a vision I have had for a long time. I rewrote the Press Release as I lay there dead. My friend Melissa is reading the Life Statement that I’ve feared to say aloud with few exceptions. The subject of death is uncomfortable at best and unwanted most if not all the time. To keep things true to my heart I left nothing out. I made it simple as the vision I’ve had for a long time. As I restore the being I was born as. I have had so much emotions and feelings that I was afraid that the past would come back to haunt me. Now I have understood the perceptions of things was the problem, nothing else. The Limits I held were self-imposed. The creations in my mind were mostly from fear. I now create what I desire and I do that with Love leading the way. I live with Love as my emotion of choice. I hide from nothing and know many things are out there. The world that I see now has always been there. I no longer look back in frustration and ask why? I take this day, this moment and experience Life to the fullest in everything I do. When I give my time with my family by being present now here, the Love is uncontainable within. I must give that away; my vessel is too full. At work, many changes have taken place. Many more to come. By being present and now here, there is no room for fear. As I engage others, I give them my peace and we are better. I am just happy all the time and actually know why. Perception of things is a choice we can make. Everything that occurs within us or in the without. We can choose how we wish to deal with it. We are being shown many ways as in the Tools they use to teach us to keep us BUSY. I have chosen to look deep within the meaning of the lesson and then GIVE everything I’ve got to earn that experience. “Give more Get More” has a different meaning than that it had when I first heard it. I have no words to share how I see it now. I do assure you though I live what I see and understand now here. This entry was posted in Master Key Experience on 02/18/2016 by masterkeyrea. I have not the time to write of each event in my week. So many things touch me. I spend much of my time focusing all of my energy to stay in the present moment. I do not do this to be recognized. This week I got caught. The day touched me, and left me knowing the path and success of my work is beyond all of the words I’ve written down. I think in pictures to begin with. I love to write, yet that which I see is not words. So I ask you forgive this post. As I work on bringing out a simple event on Tuesday of this week. I can feel and see the event so clearly yet when I start to write I lose the meaning somewhere. I am attempting to describe the explosion in my spirit, filled with Love, sharing it with others, and results that have staggered my essence of thought. I told him every day he can add something else. But the idea is to BE in the present moment. When we arrived at the first location for me to do my thing. Ananda so amazed it was hard to just see him, he said “HOW DO YOU DO THAT?” Kind of stern I said “No, we just did that. And every day it gets better”. We spent most of my day there together as several places in the airport. We became friends and talked like we had been friends forever. I was almost done with my thing and he packed me a lunch and placed it in my computer case. I honestly felt like crying right then. I could feel the Love he was sharing with me. As we left to take me back to security to check my tools back out, we practiced together all the way back. He could not even speak; I can’t describe how that feels. To be part of someone’s dream and to have helped him realize it. What I can say that focusing on the virtues and with Love in my heart, understanding that while we are operating in that space of life. We have no Law which binds us because as we’ve been taught this is adding to the world, this is changing the world. It may be only one person at a time. But to be there and to be that person empowers you. When I see that some small activity grows and grows, I can feel the Law of Growth moving within me and others. This entry was posted in Master Key Experience on 02/11/2016 by masterkeyrea. I read Robert D Watkins Post about Pretending to Understand. So instead of just reading it, I sought to understand how I could apply this. I heard and wrote down the question, from the webby. I did not take it as an exercise that had this level of meaning. Today I went to work, I drive from one service call to the next and sometimes get parts. I do drive from point to point. I have been in a Hyper Aware mode and use a Mindfulness technique of noticing every little detail of the moment to keep my thoughts from going into the future or the past. So I’m driving 50 -70 MPH, listening to my recordings with music, tapping my fingers, and noticing everything around me, heat, light, clouds, nature, people, buildings my van, my breath. This is empowering and helps train the brain. I can only handle about 4,000,000,000 connections at a time in my Brain. Info from week 4 webby. So please don’t think this is somehow overloading me. So let’s get to the point of the Question. “What am I pretending not to Know – to See – to Understand – to Observe.? Now I’m faced with a wonderful thought I don’t like. I don’t want to. No. I genuinely looked at the activities by the second to observe my thoughts. I was stunned how many things I refuse to or pretend not to see. So what does the lessons teach us to do here? THINK. OK I gave it 5 and was done. “I don’t like that” visualize a fist fight in the mind. I went there with my old blue print, and that which I intend to become. Oh I could taste the fury. Mark J spoke of this, well not quite like this. By bringing this little question to my awareness, I have begun to defeat this resistance. As we fight to BE better and Powerful beings & search for the perfect Ideal, expect this difficulty to be no more than a Blessing and perfect Opportunity. Where did I read that one? I have resolved to BE here and answer the question and the new one OMG. Mark – where do you come up with this stuff. “What would the person I intend to become do Next. Then to make things worse my virtue for this week’s focus is Enthusiasm. So here’s how that went. I’ve asked myself over 100 times today just that. 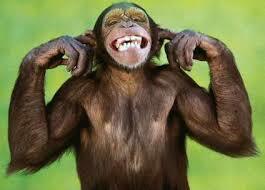 With Enthusiasm and laughing like a monkey in the Zoo. I am that person and as I ask what are you going to do now Mister Robert. So far I am so happy it just knocks some people right out of there zone. Today I had a call with a client, I’ve not seen for more than a year. We’ve been like friends since we’ve met. He is a Restaurant Owner and busy like a Bee. Well he came and we shook hands and he asked how I’ve been doing. I said I can’t say. This is my week to focus on Enthusiasm and That would take Hours. I told him what’s happening in my life and how happy I am. He wanted to know more and we stayed talking for the entire hour and he helped me all the while. The compliment he gave me, touched me. When I was leaving and he shook my hand he said, “Thank You for coming by today and being of service to this restaurant, to me and I’ll always hold you in my spirit for this meeting today. Thank You. You have changed so dramatically and are so happy, but did you notice everyone in this place is listening to us.” I said “Yes, and if I could brighten up the day of One what not all”. I almost had to cry right then and there I was so moved to see the entire staff in back where we were, was just standing there watching. How do you leave that kind of Love, and go back to work? Mark J. says it pretty grand “I Love a Mystery”. This entry was posted in Master Key Experience on 02/02/2016 by masterkeyrea. masterkeyrea on We have moved! masterkeybrony on We have moved!